Wedding Season is officially upon us and if you’re like me, everyone you know and their Moms are getting married. And who doesn’t love a good wedding party?! Especially if there are party favors 😉 I have a good friend getting married in August who is taking care of ALL the little details herself with a little help from her friends. This is the perfect way for her to step away from the DIY projects and let Pacific Cookie Company take some of the stress off her hands. 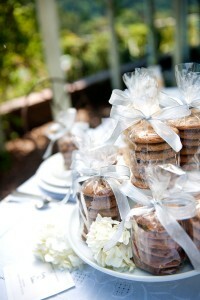 What better way to satisfy your guests than providing them with a delicious cookie party favor. The best part, you can personalize these wedding favors with your initials and theme by sending us your labels, making your favors extra special for that day everyone will remember. Don’t feel like having the big expense of an extravagant wedding cake? Surround the top tier of your cake with fresh baked gourmet cookies that perfectly compliment the flavor of the cake you have chosen. Not only are they extremely photogenic, thanks to our amazing friend and photographer, Lisa Keenan of Lisa Keenan Photography, they are satisfyingly delectable. Even if you aren’t getting married or helping a friend plan their wedding, summer parties with friends and family are a great way to share cookies as well. 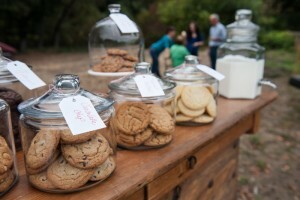 Place your cookies in classic glass jars with name tags strung around the handles/lids and accompany them with milk in a drink dispenser (pictured). This display will have your guests talking about your party for the rest of summer and summers to come. As a recommendation, put a cookie in the microwave for 10 seconds and enjoy your warm gooey cookie with an ice cold glass of milk. YUM! Happy Summer and Wedding season from Pacific Cookie Company!